A short video of the encounter between the students and a drum-beating Native American sparked outrage before a fuller version of events emerged. A report released Wednesday about an encounter between Kentucky high school students and Native American activists at the Lincoln Memorial found “no evidence” that the students made “offensive or racist statements,” either in response to the Black Hebrew Israelites who shouted slurs at them or to a drum-beating Native American. 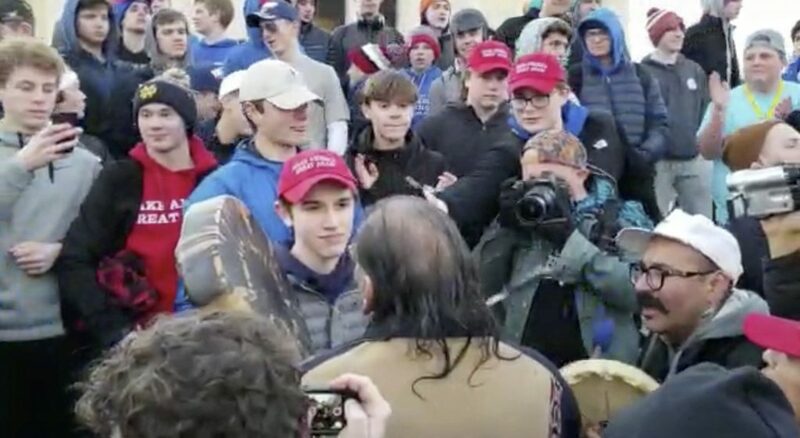 The Jan. 18 incident drew national attention after a participant posted a short video clip of the Native American, Nathan Phillips, in an apparent standoff with one of the students, Nick Sandmann, who was wearing a red “Make America Great Again” hat. The clip drew immediate and widespread condemnation online, with many commenters accusing Sandmann and other students from the private school, Covington Catholic near Cincinnati, of mocking and intimidating Phillips. Officials at the high school and the Diocese of Covington initially were among those who condemned the boys’ actions. However, after a fuller picture of the encounter emerged in other video clips, the diocese commissioned an independent firm to interview the students and their chaperones, locate third-party witnesses, review social media posts and news articles, find any additional video of the standoff and determine exactly what happened. The firm, Greater Cincinnati Investigation, said four licensed investigators spent about 240 hours interviewing witnesses and reviewing about 50 hours of internet activity, including posts on YouTube, Facebook and Twitter and video from major networks. On Wednesday, the diocese released the resulting four-page report. In it, investigators concluded that neither Sandmann nor other Covington students had behaved in an offensive manner that day.